For decades the 308 Winchester was in many respects a benchmark and go-to caliber for long range shooting. However, in recent years, the 6.5 Creedmoor has become among the most popular long range shooting cartridges available. With the 6.5 Creedmoor equaling and eclipsing 308 Winchester ammunition sales (for match 308 loadings) there is an undeniable shift in market dynamics. The question commonly asked is whether the 6.5 Creedmoor is truly superior to the 308 Winchester for long range precision shooting. Some who favor the 308 Winchester refer to it as "Gods Caliber" and call the 6.5 Creedmoor the new "hipster" cartridge. Conversely, those who favor the 6.5 Creedmoor view it as a natural progression in ballistic science and a more modern cartridge with the 308 Winchester being "old and slow". The question which is commonly asked is whether one is better than the other. In ballistics and shooting, there is always a tradeoff in performance so when the question of 'better' or 'best' comes up, our take on it is generally that it depends on the situation and context. There is no one cartridge that is the 'best' choice for every shooting scenario. The 6.5 Creedmoor undeniably offers a considerably flatter trajectory and less wind drift which has made it popular within the long range shooting community. However, the 308 Win shoots heavier bullets which provides some advantages with regards to kinetic energy. We compare our Eagle Eye Precision Match loadings of each cartridge to help shooters determine which is the best choice for their application. The 6.5 Creedmoor and 308 Winchester are both short action rifle cartridges with a .475 bolt face. The 6.5 Creedmoor also has a steeper 30 degree neck angle compared to the 20 degree neck angle of the 308 Win. The 6.5 Creedmoor fires 6.5mm or .246 caliber projectiles where as the 308 Winchester fires .30 caliber projectiles. The .264 caliber fires lighter projectiles, generally at higher velocities than the 308 Win. The Eagle Eye 6.5 Creedmoor shoots a 130gr hybrid projectile with a .295 G7 at 2,960fps from an average 26" barrel. Comparatively, the Eagle Eye 308 Win shoots a 175gr hybrid projectile with a .262 G7 at 2,750fps from an average 26" barrel. We compare the ballistic performance of each Eagle Eye cartridge and other generic factory loadings. Both the 6.5 Creedmoor and 308 Winchester cartridges are capable of outstanding accuracy. With high quality loadings such as Eagle Eye Precision Match Ammunition and when fired from quality well maintained rifles, both calibers are easily capable of sub 1/2 minute accuracy. The limiting factor in accuracy with both cartridges will be atmospherics (ie. wind) and shooter skill. The picture below shows 5-shot groups from Eagle Eye 6.5 Creedmoor and 308 Winchester loadings. When comparing the drop trajectory of the two cartridges, the 6.5 Creedmoor is the clear winner. The considerably faster velocity of the 6.5 Creedmoor means that the amount of time gravity is influencing the flight path is less. The flatter trajectory of the 6.5 Creedmoor can be seen immediately and grows considerably with distance. At 1,000 yards the Eagle Eye 6.5 Creedmoor is approximately 2 mil or 75" flatter than the Eagle Eye 308 and 3.7 mils or 136" flatter than other standard factory 308 ammunition loaded with a Sierra 175gr bullet. For shooters engaging targets at unknown distances the flatter trajectory provides an additional cushion for errors in range estimation. When engaging multiple targets at varying distances, the flatter trajectory makes for faster adjustments or smaller holdover corrections. The flatter trajectory is a significant reason that the 6.5 Creedmoor has become a highly popular cartridge for long range precision shooting. For extreme long range shooting, maintaining stability as the bullet enters transsonic speeds and becomes subsonic is critically important. Both the Eagle Eye 6.5 Creedmoor and 308 Win are excellent at maintaining stability into the subsonic speeds. The Eagle Eye 6.5 Creedmoor has a significant advantage in that it enter subsonic velocities at approximately 1,450-1,5000 yards (depending on atmospherics) while the Eagle Eye 308 Win enters subsonic velocites around 1,200 yards. While the 6.5 Creedmoor has the edge, the extended range to which both cartridges remain supersonic contributes to enhanced bullet stability and increased hit probability at longer distances past 1,000 yards. The higher velocity of the 6.5 Creedmoor means that the amount of time wind will be imparting a force on it is less. The heavier mass of the 308 bullet, means more force is needed move the projectile. The larger diameter and cross sectional area of the 308 bullet means there is additional surface area for wind to impart a force on. The higher velocity and thinner profile of the 6.5 Creedmoor significantly out perform the 308 with regards to wind drift. At 1,000 yards, the 6.5 Creedmoor has 0.4mil less wind drift than the Eagle Eye 308 win 175gr hybrid and 0.8 mil less drift than other standard factory 308 win loaded with a Sierra Matchking. While many shooters would not consider the 308 Win to have excessive, harsh or punishing to shoot by any means, the 6.5 Creedmoor does have considerably less felt recoil. In the absence of a muzzle brake, one advantage of the lower recoil is that for some it can be easier to spot trace and return to target quicker. These advantages can be accentuated if the shooter is using a lightweight rifle and/or shooting from unconventional firing positions.Returning to the topic of wind drift, when there is an error in wind estimation, since winds are constantly shifting, one of the best things to do is to get a second follow up shot off quickly before the winds change. The lighter recoil may assist some shooters in spotting trace and getting an adjusted second on target shot off slightly quicker. Again, modern muzzle brakes have become very efficient and when either cartridge is paired with one, the magnitude of the difference becomes smaller. One place where the 308 Win has an advantage over the 6.5 Creedmoor is with respect to kinetic energy at the muzzle and intermediate ranges. While terminal ballistic performance depends heavily on shot placement and projectile design, putting more energy on target is always beneficial. Kinetic Energy = 1/2Mass*Velocity^2. Since velocity is squared, increased speed can often lead to substantial gains in kinetic energy. However, as with everything in ballistics there is a tradeoff and effects depend on where measurements are taken. While the 6.5 Creedmoor is significantly faster at the muzzle than the 308 Win, the additional velocity of the 6.5 is not enough to make up for the extra mass of the heavier 308 Win projectile at the muzzle. At the muzzle, the additional mass of the 175gr 308 bullets allows the Eagle Eye 308 Win 175gr hybrid to generate 2,939 ft/lbs of energy compared to only 2,529 ft/lbs with the Eagle Eye 6.5 Creedmoor 130gr hybrid. However, the higher velocity of the Eagle Eye 6.5 Creedmoor allows it to develop kinetic energy much closer to other standard 308 factory load with a Sierra 175gr which only produce around 2,675 ft/lbs or 257 ft/bs less than the Eagle Eye 308 Win 175gr. While the 308 Win may have the advantage at the muzzle, the more aerodynamically efficient shape of the 6.5mm bullets allow the 6.5 Creedmoor to retain velocity better than the 308 win. As a result, at extended ranges the 6.5 Creedmoor has the edge in kinetic energy. At 1,000 yards the Eagle Eye 6.5 Creemoor 130gr hybrid produces 749 ft/lbs of energy compared to 688 ft/lbs of the Eagle Eye 308 Win 175gr hybrid. One place where the 308 Win is a clear winner is barrel life. The 308 win offers excellent barrel life. With well maintained rifles with high quality barrels it is not uncommon for barrels to last in excess of 5,000+ rounds. While the 6.5 Creedmoor also achieves very respectable barrel life, shooters generally do not see much in excess 2,500-3,000 rounds. In all of our Eagle Eye Precision Match ammunition loading we use a slower cooler burning propellant blend than common industry standards. The use of a slower cooler burning propellant helps to slow throat erosion and extend barrel life. Both the 6.5 Creedmoor and 308 Win are relatively easy rifles to clean. Neither caliber is prone to developing particularly odd problems in the absence of cleaning such as excessive hard carbon accumulation and carbon rings sometimes present in other calibers. In general, we find both calibers are very forgiving and can go for extended periods with minimal or light cleaning without adverse effects on accuracy.That said, we do always recommend regular cleaning and maintenance of firearms. While there are several excellent cleaning products on the market, we generally use Bore Tech cleaning products in all of our testing and demo rifles. While other factory ammunition is commonly downloaded, Eagle Eye Precision Match Ammunition is loaded to its maximum potential and optimized for long range precision. The full magnitude of the difference can be seen in the table above. The result of the higher performance of our Eagle Eye Precision Match cartridges are contrasted with the generic loading specifications of standard factory ammunition means both our 6.5 Creedmoor and 308 Win loadings significantly outperform their competitors. While the 6.5 Creedmoor does offer some substantial performance benefits compared to the venerable 308 Win, our Eagle Eye 308 Win 175gr cuts the difference trajectory drop and wind drift between a generic factory 308 and other generic 6.5 creedmoor nearly in half! Furthermore, the added performance of our 6.5 Creedmoor significantly outperforms generic factory loadings on several key metrics. In fact, our 6.5 Creedmoor provides a trajectory on par with, if not better than some other generic factory 6mm Creedmoor loadings (see our blog on Maximizing Long Range Ballistic Performance or our ballistic comparison of 6mm Creedmoor vs 6.5 Creedmoor for more information). 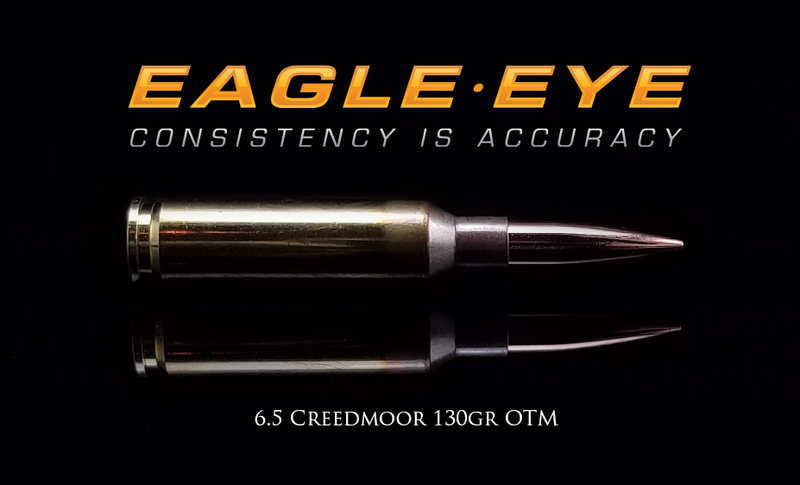 Finally, both of our Eagle Eye Precision Match 6.5 Creedmoor and 308 Win loadings offer several hundred ft/lbs more kinetic energy than other standard factory loadings. For those who expect the best and want unmatched consistency, accuracy and long range ballistic performance, Eagle Eye Precision Match Ammunition is the brand of choice. The 6.5 Creedmoor is rapidly gaining in popularity among long range precision shooters and for good reason.While both cartridges are capable of exceptional accuracy, the 6.5 Creedmoor provides clear advantage over the 308 Win with respect to the flatness of the trajectory, less wind drift and ligther recoil. Although the 308 Win provides more kinetic energy at short and intermediate ranges, at distance, the higher retained velocity of the more aerodynamic 6.5mm bullets allow the 6.5 Creedmoor have higher kinetic energy.